Look around your workplace, and chances are you’ll find flammable and combustible materials. Examples include paints, aerosols, solvents, cleaners, oils … just to name a few. Anyone working with one of these substances needs training on how to work safely with it, including how to protect themselves from its hazards (such as flammability). But even with training, questions come up. Here are a few of the most common questions. Q: Can flammable liquids be stored in plastic containers? Containers that are listed and labeled with an approval from a nationally-recognized testing laboratory (NRTL). That said, any plastic containers used for flammable liquids must be approved by DOT or an NRTL. Q: What about portable gas cans in the workplace? A: OSHA generally expects all flammable liquids to be stored in a flammable storage cabinet, inside a storage room, or flammable storage warehouse. You are allowed to have enough flammable liquid for a single shift or a day of work outside the protected storage. However, there is an exemption for incidental storage. OSHA allows you to store up to 25 gallons of Category 1 and 120 gallons of Categories 2, 3, and 4 in containers and any one “fire area” of the facility outside of the flammable cabinet or storage room. Q: Can flammable liquids and corrosive chemicals be kept in the same storage cabinet? Inside an approved storage cabinet. Q: What is the distance a flammable storage container can be from an exit door? When using exits, employees must not have to travel toward a high hazard area. Q: Does OSHA have a rule about storing and disposing oily rags? Oily or solvent-soaked rags can easily start a fire through spontaneous combustion. Prevent this by using specially designed oily waste cans for temporary storage. These cans have spring-loaded lids and raised bottoms with vent holes to dispense heat. Remove flammable liquids from the rags before placing them in the temporary containers. Drain cans and liquid disposal cans offer the greatest degree of safety at your workstation. 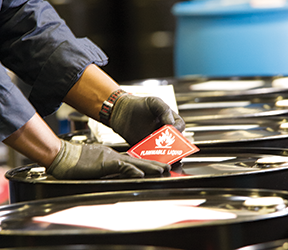 The Hazardous Materials Compliance manual provides thorough, reliable guidance on how to prepare and ship hazmat ... safely and in full compliance with the complex, detailed, and continually changing Hazardous Materials Regulations. Try this manual for free or view our full library of compliance publications.